We are a low overhead, open-source, grassroots effort. Your donations make the Living Room Conversations project possible, and we deeply appreciate your support. Please donate online using the form to the right. Where does the money go? About 90% goes to staffing—people are what make Living Room Conversations work. 3% goes to support staff travel and being part of larger coalition events as well as events we ourselves sponsor; these events expenses can include food, printing of materials, and advertising. 7% goes to our fiscal sponsorship (see #1). Where does the money come from? 75% of our funding comes from individuals—just like you! 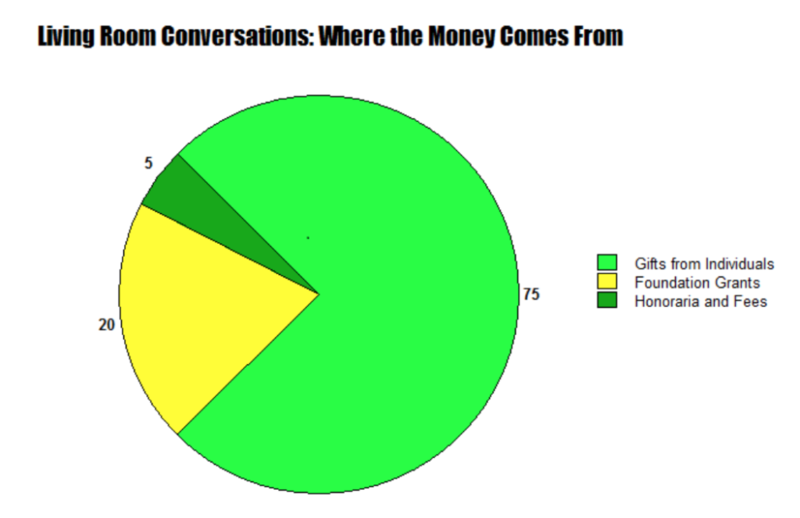 Living Room Conversations is supported by wealthy people, people with small incomes, and people in between. What did you raise last year? About $150,000; this supported 10 staff (all part-time, including some who volunteer) who support a network of mostly volunteer organizers throughout the country. We estimate that in-kind volunteer hours donated by our trained organizers, promoters, and hosts easily brings our total to a million dollars last year raised in-cash and in-kind. What do you hope to raise this year? In-cash, $500,000, to stabilize our part-time staff increase, offer slight salary increases and begin supporting more of our organizers’ events with small amounts for food, materials, and advertising. In-kind, we hope for at least another million dollars in donated hours! Why should I give? Living Room Conversations are free of charge: it is free to download all our Conversation Guides, Conversation Agreements, how-to information and even our “Create Your Own Conversation” information. 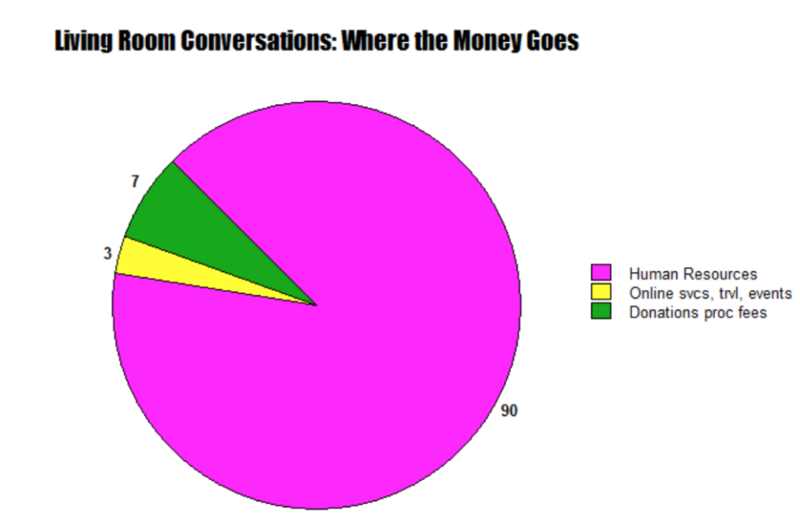 But Living Room Conversations cost money: all of our materials are created by skilled professionals; our training materials and events plus our in-depth, personal organizer support are made possible by professional organizers, and our outreach and promotion are done by professional staff. That’s why 90% of our funding goes to human resources. What difference does my gift make? Living Room Conversations are intended to be used by everyone to build bridges and make problem-solving across differences possible, enjoyable and strong. We are as strong as our people. This is true of our democracy as well as Living Room Conversations itself. We seek to engage and give away our tools and practice to as many people as possible, while engaging the support of as many people as possible—as donors, hosts, organizers, and promoters. This includes you!